The position in which we sleep ultimately comes down to personal preference, but it’s not a choice that we make consciously. The chances are you’ve been sleeping in your preferred position since childhood, and it’s something that we rarely question – that is until it starts causing us problems. Whilst achieving deep sleep is the main priority, minimising discomfort and damage is important, too. So, this month, Thorne Road Chiropractic Clinic will be taking a look at the benefits and drawbacks of different sleeping positions. Not particularly common, sleeping on your front is generally considered to be the least optimal position for most healthy individuals, largely because the neck is rotated to one side. While your muscles won’t get stuck this way, if you’re experiencing neck pain or related issues, we would certainly advise against sleeping in this position. A further problem of this position is that it causes it a great deal of lower back extension. If you find it uncomfortable to arch your lower back for extended periods of time, the likelihood is this position isn’t for you. Despite all this, many people do find this position comfortable. If you fall into this camp, here’s what you should do: 1) use a thinner pillow to neutralise your neck position, and 2) place a pillow underneath your pelvis to minimise lumbar extension. For most people, sle eping on your back should be fairly problem free. Unlike sleeping on your front, the neck is in a comfortable position, making this a good choice for those who experience neck pain. However, it should be noted that sleeping on your back can restrict the airway, which can ultimately result in snoring. While this might be the biggest problem for you, it could well be for your partner. 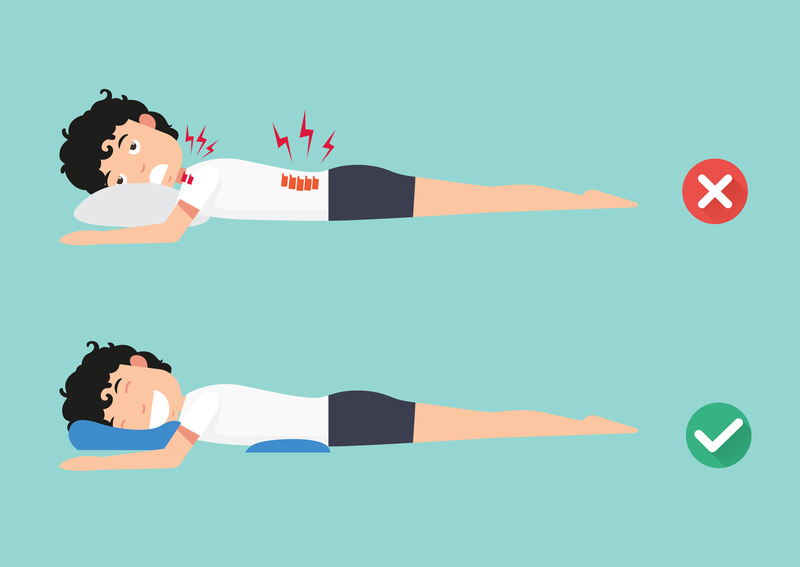 If you choose to sleep in this position, wedging a pillow underneath your lower back will help incline your torso, allowing you to breathe more deeply. This is certainly the most popular sleeping position, and probably the most optimal for the majority of people. With the spine unloaded and the airway unobstructed, snoring will be much less likely and discomfort in the neck and back will be minimised. However, to optimise this position, some adjustments may need to be made. In order to get your spine in a neutral position, ideally, you want your head pillow to be such that your neck and spine form a straight line. Similarly, if you like to have both knees bent when you are sleeping, placing a pillow between your knees can be a great way of relieving pressure. If you’re experiencing neck or back pain due to a sub-optimal sleeping position, Thorne Road Chiropractic Clinic in Doncaster can help. Through careful manipulation of your spine, our highly qualified team of chiropractors can solve various musculoskeletal problems, improving your physical health and overall quality of life. For more information, simply give us a call.